노동과건강 - 13 deaths within a year at the ‘death factory’…what happened ? 13 deaths within a year at the ‘death factory’…what happened ? The daily precipitation was 37.7 mm and the average amount of clouds peaked at 10. Moreover, it was very foggy near the ocean. At 9 pm, the view was almost blocked but they had to work. They would run into a problem the next day if the block was not loaded at the cliff. That was the reason why Mr. Kim, a signaler for block-load transport worked in the bad weather. The transport is a centipede looking car and they always company signalers back and front as a driver can’t secure a view like a tank. The accident suddenly occurred. He was indicating a sign to move forward while watching the transport. They had to load the block very near the cliff. Kim was signaling while moving backward. It was the middle of night and raining so it was difficult to see where the ground and sea were. Eventually, it happened. Kim walked backward not knowing it was the edge of cliff and he fell off into the sea. A diver was sent to find him but the waves were rough and it took over an hour to find him. When he was found, he was already dead. They were supposed to stop working in rain but kept working ignoring the rule and the incident followed. We were told the incident wouldn’t have happened if there had been a safe fence installed. The safe fence was set after his death. At the rate of one death per month, it was a ‘death factory’. The causes of the deaths were also unusual. They were killed by fall, crushed and stuck in between two objects. They were ‘typically preventable accidents’. Those deaths could have and should have been prevented. This is a story of the world’s largest shipyard, Hyundai Heavy Industry (refer to as HHI below), where 13 subcontracting workers were killed in 2014. Looking into fatality cases due to critical accidents in 2014 at HHI and HHI’s affiliates, they are classified as 5 falls, 2 traps, 2 crushes, 2 suffocating, 1 medical condition and 1 unknown (reported as suicide but still under investigation). Let’s look into each case one by one. On 20th March, Mr. Park fell down 12 meters below and died while he was fitting a scaffold on the outer wall of a block at Hyundai Samho Heavy Industry. Blocks which are a part of ships, are supposed to have a scaffold fitted on the ground before they are loaded on the ship. It is to prevent falls but they didn’t follow correct procedure. The incident followed as they fitted a scaffold after the block loaded on the ship. Moreover, he worked where harness for life line and drop sheet were not installed even though they were supposed to be by law. If there had been a drop sheet, Park wouldn’t have died. The incident on 7th April followed a similar pattern. Mr. Jeong tried to take a tape off a pipe, which was just out of reach and fell 8.6 meters to his death. He wouldn’t have been killed if the safety rules had been kept, which were safety fence with drop sheet and working as a group in pairs. The accident on 27th November would not have happened if there had been a drop sheet. Mr. Lee who was finishing the work in a block fell down from the 3rd floor scaffold. He missed his step in the dark worksite working with only one small head lantern. There are also so many incidents by not following basic safety rules. On 7th March, 2 ton steel sheet from a crane dropped and hit a worker at Hyundai Samho Heavy Industry. It was a man-made disaster by violating the safety rule that a crane should not lift 2 steel sheets at the same time. Furthermore, there was no operator and conductor working, which were mandated by Occupational Safety and Health Act. The incident on 25th March, the work itself was illegal. 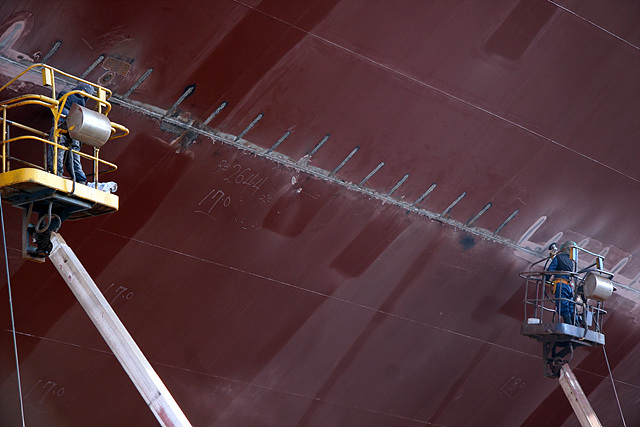 When ships are completed, scaffold should be disassembled and this is being done by workers. Disassembled scaffold are piled at the front head of ships and a crane moves these away. The problem is the disassembled scaffold parts should be placed in the front head of a ship but they made an illegal cradle outside of the ship and piled parts, so that they can move quickly. This is illegal and the incident followed accordingly. While they were moving parts with two 60 bundle (1.6 ton) scaffold on the cradle, the cradle collapsed and 3 workers fell into the sea. 2 were injured and 1 died. The fire incident of LPG ship on 21st April was aggravated by late response. It is believed that the fire became big as there wasn’t even a common fire extinguisher. The lack of basic safety preparedness caused the incident to grow out of control. 2 were killed as a result of this accident. One was an inexperienced worker, not even knowing sea rescue regulations. The fire accident happened on his first day of work at HHI. He didn’t even receive any safety orientation and was sent straight to work, which was illegal. The other victim was an x-ray inspector, who checks welding parts. His death is an evidence of parallel work, which is forbidden at the worksite. The incident rate of parallel work cannot even be compared to that of single work. Mr. Ahn was killed, crushed by a 3 ton ship part on 23rd October. The crane belt was broken and the part crashed while it was being moved by a crane. Ahn was a signaler working under the crane. They should have put a rubber band over the crane belt when they load an edgy material. Otherwise, the belt can be damaged by the edge. Ahn would not have died if they had put an extra rubber cover. Mr. Lee was killed when he stuck his head between an elevator and a trunk stiffener. He went into the elevator to rectify a problem in the elevator and was killed by an operation error. Lee was only 21 years old. He had just finished his army service and worked in the shipyard to pay university tuition fee. Experienced workers are usually being dispatched to beginners at shipyards as shipyard work has risks. In this case, all workers were beginners and we were told it would not have been happened if experienced worker had worked together. All of the above cases were accepted as occupational accidents except Mr. Cho, who was found collapsed during work on 23rd August. It was known that Cho was a subcontracting company team manager and had had a tremendous stress from the relationship with the shipyard owner company. He used to work for 15 hours from 5 am to 9 pm. It suggests a possibility of work stress and overtime related death. However, his family did not apply for an occupational fatality. Incidents at worksite are easily accepted but they have to prove the work-related connection in Cho’s case and it is very difficult to be accepted. Even if they fight for it for several years, it is less likely Cho can win. According to Metal union, HHI subcontractors’ branch, similar cases like Mr. Cho occurs 3-4 times per year. Mihyang Hyun, the director of Ulsan Occupational Incident Free Association said, “All dangerous and difficult works have been dumped to subcontractors at shipyards so where subcontractors work naturally is dangerous”. She also said, “The more dangerous the worksite the more safety rules and actions should be taken but it isn’t in reality and that’s why ridiculous fatalities are still happening”.